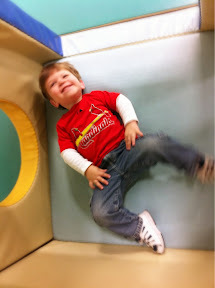 Mom just sent me this picture of Luke at Gym Time. Gym Time is a weekly class at the Early Childhood Center. Luke needs that time to stretch out and burn off that stuck inside energy he'd been saving all week. It also gives him a chance to expand his physical limits (climbing, jumping, etc) in a padded environment. This class is in our old school district so we won't be going back after this year. Hopefully the new district has something comparable.